Arvind's World: A good read is better than Lagavulin!- enjoying "Sea of Poppies"
A good read is better than Lagavulin!- enjoying "Sea of Poppies"
The real test to judge the quality of a novel, I feel, is when we start living in the characters and the theme while reading it and when we actually slow down the speed at which we read as it progresses while never leaving it, for the fear that it will end soon! It brings characters and situations alive and develops its themes without ever being cute, clever, wordy or pretentious. I don’t claim myself to be well read so far as fiction is concerned but I must also confess that I have got into the habit of reading ‘good’ fiction, based on the recommendations by friends or book reviews. 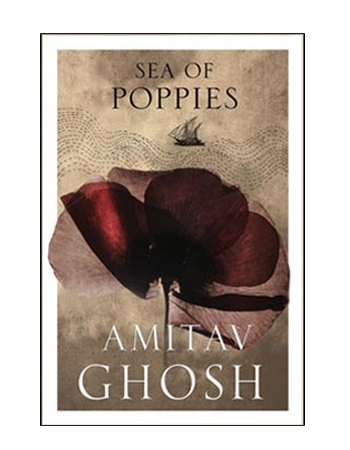 That’s how I came to read ‘Sea of Poppies’ by Amitav Ghosh. I wouldn’t have read on my own but it was strongly recommended, perhaps, knowing that my roots are in Bihar and that I may like the theme. And it turns out to be one of the best novels I have ever read so far. Amitav Ghosh makes it look so real- the characters, places, theme, language and the historical perspective that one often wonders whether it actually never happened. Its richly textured and minutely researched. For like the opium that forms its subject, the narrative becomes increasingly powerful and addictive as it takes hold. I remember telling my father that I would like to visit Ghazipur (the novel describes an opium factory in Ghazipur, being managed by the Britishers in mid nineteenth century) and he informed that there’s actually an opium factory existing in Ghazipur! Amitav is brilliant in capturing the history, feudal structure as prevalent in eastern part of India, language (Bhojpuri), excellent usage of simple and yet very effective English ( “guilty vividness”, ‘a lamb’s wool sky”) and all the while maintaining the basic theme of the story in a very gripping manner. I almost cried the way he describes the relation between Deeti and her six year old daughter Kabutari esp. when Deeti meets Kabutari, for the last time and the way Kabutari tells her “hamre khatir churi lelaiya?” (please get bangles for me). Or when he describes the mixed emotions of Paulette (Putli or Pagli) towards Zacchary as she washes her clothes ”It was not unusual for Paulette, when going through her washing, to come upon a shirt, banyan, or pair of trowsers that she recognized as Zachary’s. Almost unconsciously, she would slip these garments to the bottom of her pile, saving them for the last. When she came to them, depending on her mood, she would sometimes subject them to an angry scrubbing, even beating them upon the deck-planks, with all the vigour of a washerwoman at a dhobi-ghat. But there were times also when she would linger over their collars and cuffs and seams, going to great lengths to scrub them clean. It was in this fashion that she was cleaning a shirt of his one day". Ghosh also makes powerful psychological observations such as “power made its bearers act in inexplicable ways –no matter what” or “when we kill people (or export opium to China and wage a war against its protection in the name of free trade) we feel compelled to pretend that it is for some higher cause. it is the pretence of virtue that will never be forgiven by the history” . Ghosh has turned out a novel of intoxicating stuff, sombre brilliance, offering an amazing blend of sympathy (kabutari, Deeti, Neel) and cynicism, irony and joviality. Sea of poppies is the first in 'Ibis triology', a great narrative that gently unfolds the history and I am already onto "River of smoke", the second in the series.